Let us take a look at a well known emblem from the Aurora consurgens, the earliest manuscript, MS. Rhenoviensis 172, being of the 15th century. It is now is held by the Zentralbibliothek in Zürich. This depicts a house, which is described allegorically as a treasure house built on a rock, and the text then goes on to describe the fourteen corner stones, each of which is named as a virtue, as Humility, Holiness, Charity etc. I would like us to focus here on the figure seated on the lower right reading a book. 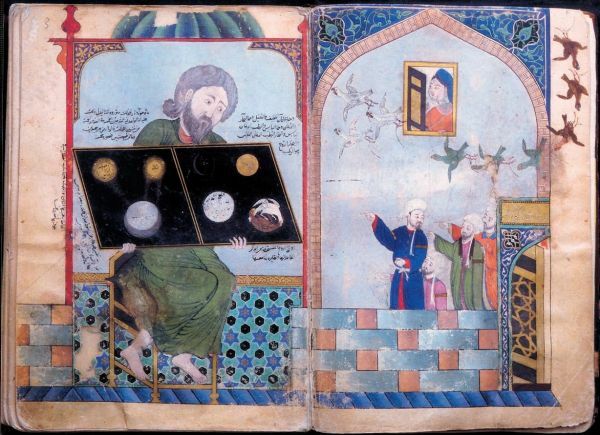 The old philosopher in a blue robe holds open a book so we see two facing pages.The page on the right shows two golden suns sending rays down onto a circular globe. 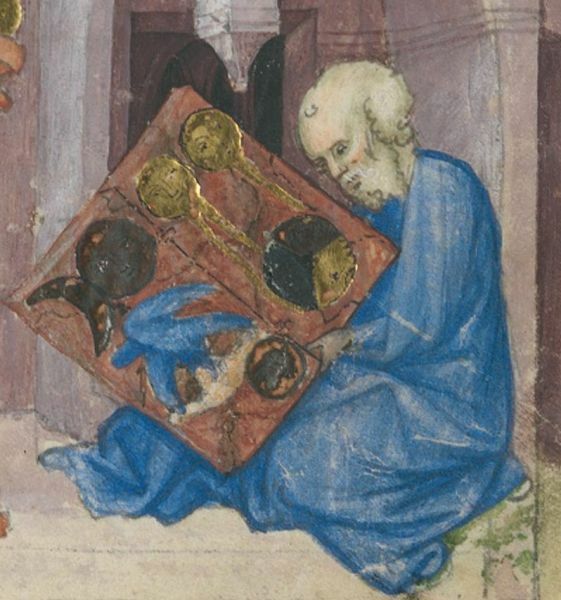 Parts of this illuminated page have applied gold leaf. 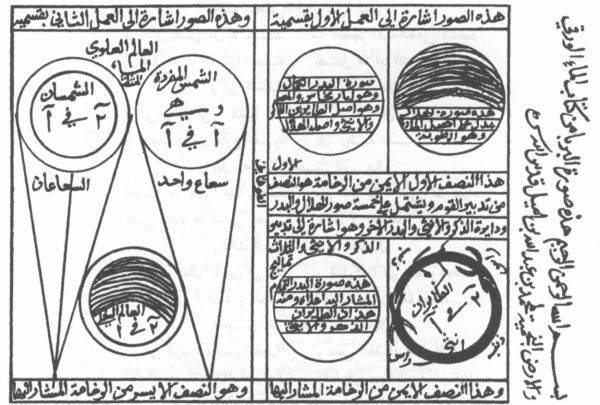 The page on the left shows two Moons, one in quarter and the other full. Though they appear black, they are actually illuminated with silver leaf which, over the centuries, has tarnished. Some people, unfamiliar with this tarnishing, so well known to experts in medieval manuscripts, erroneously refer to these blackened forms as 'Black Suns'. Though black suns do appear in a few alchemical works, this is not what is being depicted here. 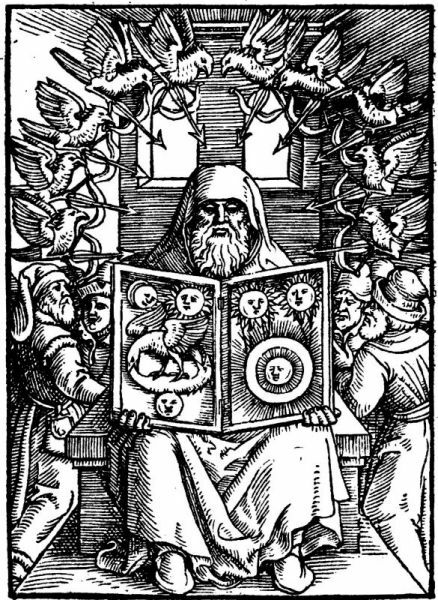 This image of the philosopher with the book later appeared in woodcuts in some alchemical printed books. For example Reusner's Pandora of 1582 draws on the image which also appears in the manuscripts of the Buch der heiligen Dreifaltigkeit. I show these two here. A woodcut version appeared in Zadith ben Hamuel De Chemia Senioris, 1560. This identifies the figure as the early arabic alchemist Senior. 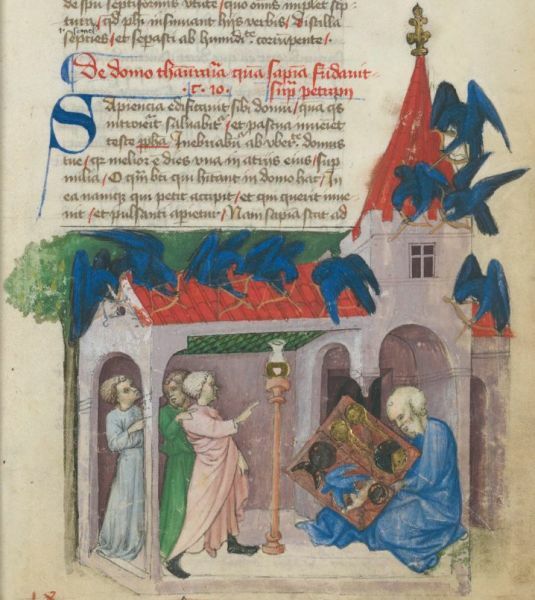 In this we see that the page on the left depicts a winged bird and a snake forming an ouroborus. Here Senior holds the book open for us to view the images, rather than contemplating them as we found in the earlier Aurora consurgens image. It turns out that this image predates its appearance in the Aurora consurgens and the Buch der heiligen Dreifaltigkeit by a century. The 'Silvery Water' painting is an illustration in a compilation of Arabic and Persian alchemical texts, probably created in Baghdad, 1339. This manuscript, A. 2075, is now in the Topkapi Palace Library in Istanbul. Silvery water is likely to refer to liquid mercury. Here we see some considerable differences from the later versions. The action takes place in two rooms or spaces. The main figure, holding open the book, is seated on the left. He appears in the dress of a Byzantine Christian figure, while in the rightmost area four turbaned figures gesture towards him, and above them a woman gazes out on the scene from a window. In this image the birds (here nine in number) are not placed around the figure with the book but instead fly in from the rightmost page - three are brown, three green and the leading three are white in colour. They appear to have jesses (leather tethers used in falconry) attached to their feet. When we examine the book, we note that the pages are reversed in the later versions. Here the Sun page is on the left and the Moon on the right. The ouroboros is formed here from a red and a white bird. To try to understand the context of this image we should realise thatit is immediately preceded by an allegorical story similar to that of the Emerald Tablet of Hermes Trismegistus, of how ancient alchemical knowledge was preserved on a tablet and then rediscovered in an ancient Egyptian temple. Surrounding this book are some explanatory texts in arabic. The text to the right above the tablet states: "They are two vapors: the light and the heavy. They are the steam and the smoke. They are the dry and the moist. The smoke is the dry; the steam is the moist. The smoke is the soul; the steam is the spirit, and it is the moist." 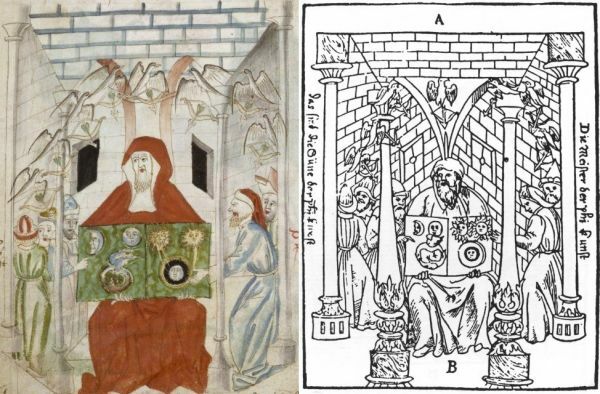 The text to the left above the tablet says : "Water, air, and fire: therefore they have drawn it as three, to indicate thereby that it is one, within which is three. They became five in number. And the five is from two. Thus, they have said that the earth is of two substances and the water is of two natures. And they drew it as five." This statement is rather confusing and difficult to interpret. Below the book on the right, underneath the ouroboros birds is "The female is the spirit extracted from the male, carrying it, flying away with it". 'Silvery Water' is likely to refer to Mercury and 'Starry Earth' probably is Sulphur and we are likely dealing here with the early arabic alchemical concept of the mercury-sulphur theory of matter. It turns out that there are at least three other arabic manuscripts of the Umail - one was located in Lucknow, India at the beginning of the 20th century, the second is in the Bibliotheque Nationale in Paris, Ms 2610 (De Slane's Catalogue), while the third was recorded in Baron Rosen's catalogue of the St Petersburg library as Ms 198. None of these has a wonderful coloured drawing as in the Istanbul manuscript, but instead have line drawings of the figures in the book that the adept holds open. Here is the image from the Lucknow manuscript. Information about these manuscripts can be found in an article in the Memoirs of the Asiatic Society of Bengal, Vol XII. No. 1, pp 1-213. 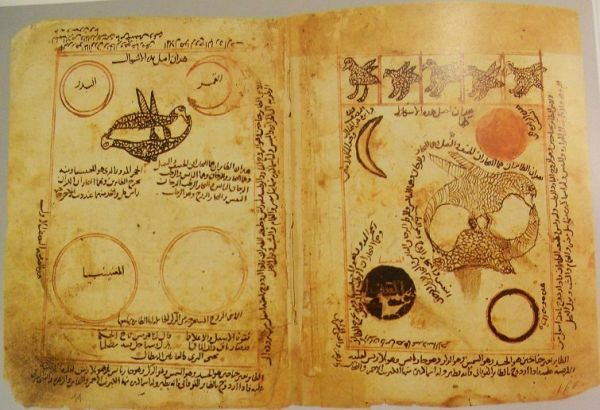 This includes an edition of the texts transcribed in arabic, with a commentary by the alchemical scholar H.E. Stapleton, and M.H. Husain. It includes a key in English to the diagram above. I have just discovered this interesting manuscript (Arabic MS 187) in the Biblioteca Riccardiana in Florence. It is a version of the Umayl work. Here are folios 10v and 11r.